The new iPad is an excellent tool for mobile development training – CSE Software Inc. If your company is committed to mobile app development and wants to ensure your workers have access to the latest technology, the recently- announced Apple iPad will be an important tool. Its improvements over previous models make it even better for conducting training sessions, so consider buying one or more to make employee instruction easier. Here are some features the new iPad sports that are perfect for this purpose. While these devices feature many different levels of memory, the largest will be 64 gigabytes. If your organization uses Apple app development, you won't want to have to constantly swap out different training applications depending on the situation. Keep them close with this enormous storage capacity. One of the best things about iPad app development is pictures, video and schematics can be shown in great detail. The new tablet from Apple is no exception, as it boasts a screen resolution of 2048×1536 DPI. This means visual demonstrations and images won't lose anything in their conversion to digital and can even be enhanced for enterprising trainees who want a closer look. The new iPad will feature an A5x processor, which doubles the power of the previously used A5 chip. This means apps will load more quickly and won't ever lag, so there won't be technical delays in training sessions. Keep this in mind if your organization is already hard-pressed to come up with times when new workers can be trained before they're sent into the workforce. Access to the internet is a crucial element of training, and the new iPad can become a personal hot spot for wireless service. In fact, a number of devices such as smart phones and tablets can be used for mobile development training in nearly any setting when the iPad's 4G network the iPad shared with other devices. Some training sessions take place in classrooms, while others are conducted in the field or at a facility. 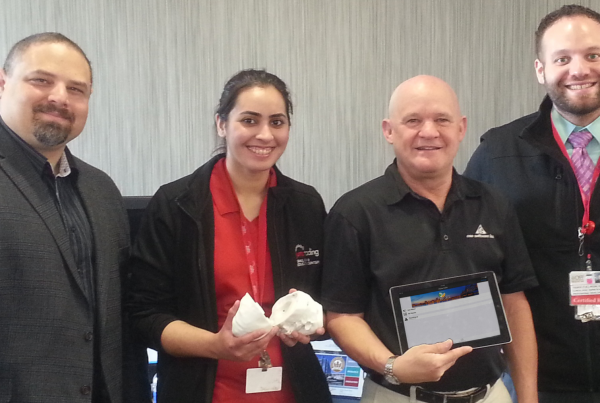 Give all employees and trainers the ability to communicate with one another by distributing new iPads. The tablets include built-in cameras and microphones, which means they make great communication devices for distance learning purposes.